This has been a busy month. Check back soon for this posting. 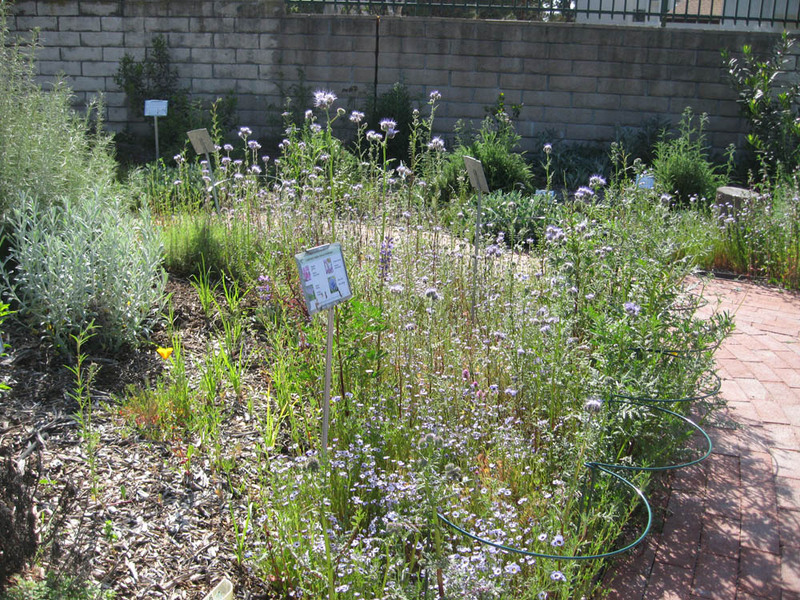 Southern California’s wildflower prairies are becoming rare due to urbanization and other factors. Fortunately, native annual wildflowers are easy to grow and seeds are readily available. Growing wildflowers in your garden provides enjoyment now – and a source of garden craft and food materials for later. See our blog posting on ‘Growing Annual Wildflowers’ (January 2013) for tips on growing these lovely plants. One of the easiest spring garden crafts is pressing flowers. At this time of year, annual wildflowers are at their peak in local gardens. What better time to preserve a little spring beauty to enjoy throughout the year! 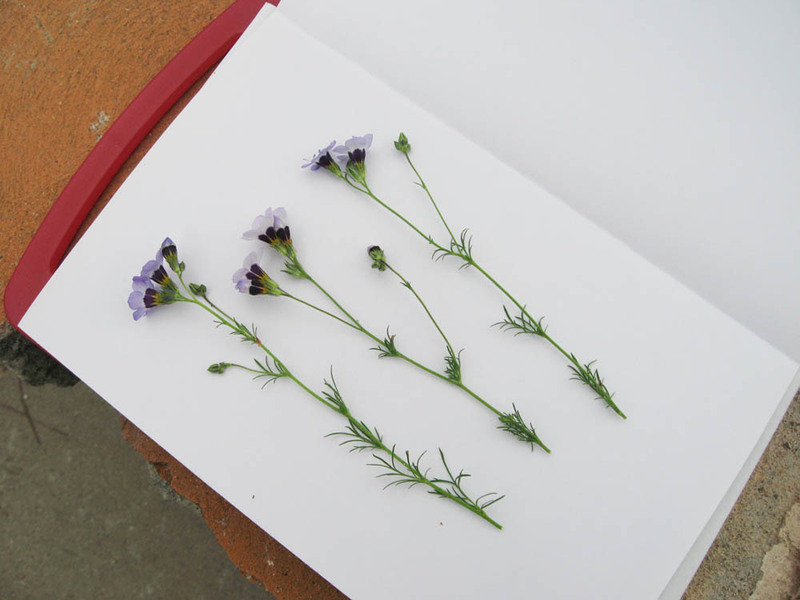 Next month (May 2013) we’ll discuss ways to use pressed flowers; this month we focus on the actual mechanics of pressing flowers. Many universities and natural history museums have herbariums or collections of dried plant specimens, usually documenting plants that are native to a particular region. 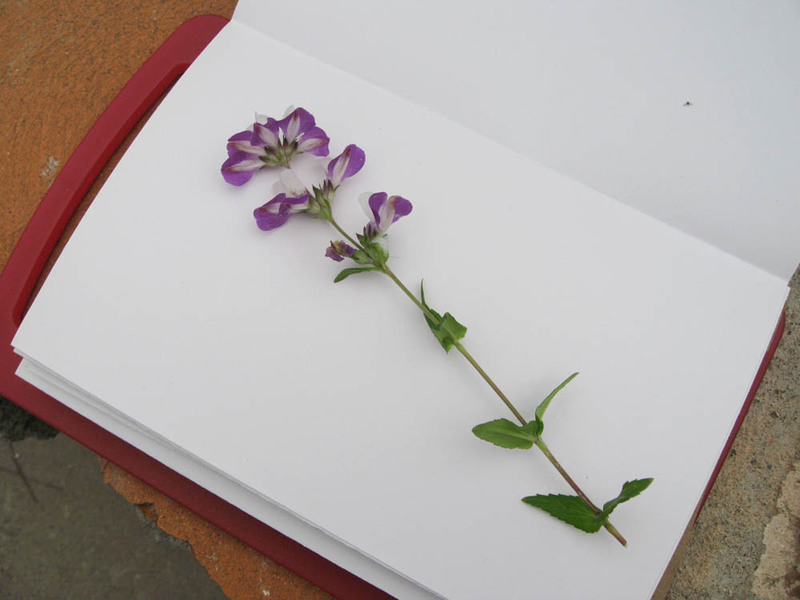 Herbarium specimens are created by drying and flattening plants parts – even entire plants – in a plant press. Once dried, specimens are stored under cool, dry, bug-free conditions. They survive in surprisingly good shape for many years; and are an invaluable resource for scientists. You can use the same methods to dry flowers from your own garden. There are several ways to press flowers. The key requirements are: 1) the flowers are dried (often slowly) to a very dry state; 2) they are pressed flat (by applying pressure). We prefer old-time methods, but you can explore other techniques in the ‘Resources’ at the end of this posting. You may have pressed flowers between the pages of a book – or under a stack of heavy books. This method works fine, but there’s a risk of ruining the books in the process. So unless the book(s) are no longer needed, you might want to consider using a plant press instead. Plant presses can be purchased at science/teacher supply stores and craft stores. But they are easy and inexpensive to make. Every plant press has two sturdy, flat ‘press-boards’ that are used to apply pressure. You can cut the boards from plywood or purchase two inexpensive, sturdy wood or plastic cutting boards (see below – we chose plastic). The surface should be smooth on at least one side – not textured or warped. If you want to press only flowers, a handy size is about 6 inches (15 cm) by 12 inches (30 cm). Next you’ll need a method to apply pressure to the plant press. Many purchased flower presses have a bolt with a wing nut through each corner; these can be tightened to apply pressure. You can do equally well using four stout cords, straps – even bungee cords – wrapped around the plant press (see below). Alternatively, you can just place several heavy books or bricks (cinderblocks are great!) atop the press to apply pressure. All you need is some way to cinch down the press tightly – or weigh down the press-boards. 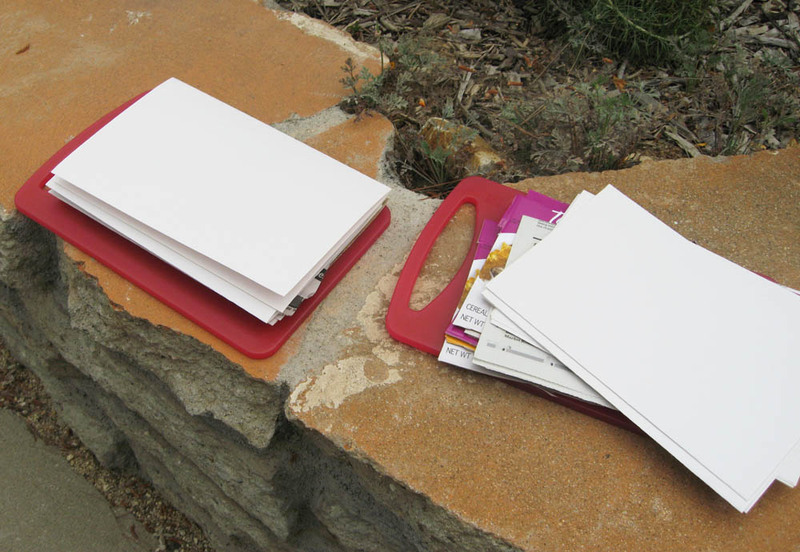 The plant press is filled with sheets of paper, cardboard and newspaper (or blotter paper) which absorb water from the pressed flowers (see photo, above). Once again, readily available materials will do. Sheets from an inexpensive 9 x 12 inch sketch pad can be folded in half to make a set of 9 x 6 inch folios to hold the plant materials. Sections of newspaper, folded and cut to size, make dandy blotting papers to layer above and below the folios. And pieces of cardboard – either chipboard or corrugated – can be cut to size to provide added stiffness. Use only plant material that is dry – wait for the dew to dry before collecting. Begin with relatively small and thin flowers until you gain some experience. You can collect only flowers or flowers with some foliage – a 6-8 inch stem works well. You may want to include some additional foliage to use in your dried floral crafts. We find it best to wait about 5 minutes after cutting before putting the plant material in the plant press. The flowers/leaves will wilt just slightly, making them easier to position. Open the plant press and place a layer of cardboard and then a layer of newspaper/blotter on top of the bottom press-board. Next place a folio sheet on the newspaper. Open up the folio and arrange flowers and foliage so they look attractive and natural. Be sure that each flower has plenty of space (see above). Carefully close the folio, add a layer of newspaper, then another folio, and so on. If the flowers are very thin, you’ll only need one newspaper/blotter layer for every 2-3 folios. Place a layer of cardboard every inch to add stiffness. Once all the flowers are in the press, add a final layer of newspaper topped with cardboard and then the top press-board. 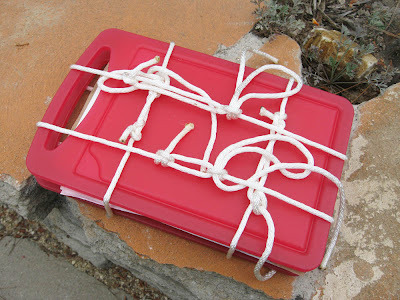 Cinch up the cords/straps or place bricks/heavy books atop the press. Place the press in a dry shady spot (indoors or out) to dry. Check the press in a day or two and tighten the cords/straps if needed. Remember, the plants materials will shrink as they dry – and it’s important to keep them flat throughout the drying process. After 4 days, open the press and check the plant materials. If plants are thin and the weather is hot/dry your plants may already be dry. If plants are still moist, replace the newspaper blotters with dry ones, and close the press to continue drying. You can air-dry the wet blotters and re-use them many times. Once the flowers are completely dry, remove them from the plant press. They will be brittle, so store them in a safe, dry place until you use them. It’s April and many native plants are blooming. Particularly lovely are the annual wildflowers, which we’ve had to water several times this winter/spring due to very dry conditions (1/2 the normal rainfall). Despite the dry weather, the Bird’s-eye Gilia, Arroyo Lupine (Plant of the Month April 2012) and other wildflowers are putting on quite a show for our April wildflower events! Annual wildflowers are among the crown jewels of our California natural heritage. Gardeners throughout the world plant California natives like Lupines, Clarkias and California Poppies. During the 1800’s, explorers gathered seeds of many California wildflowers and brought them back to Europe. They have brightened gardens world-wide ever since. Bird’s-eye Gilia is a member of the Phlox Family (Polemoniaceae), which is relatively common in California. 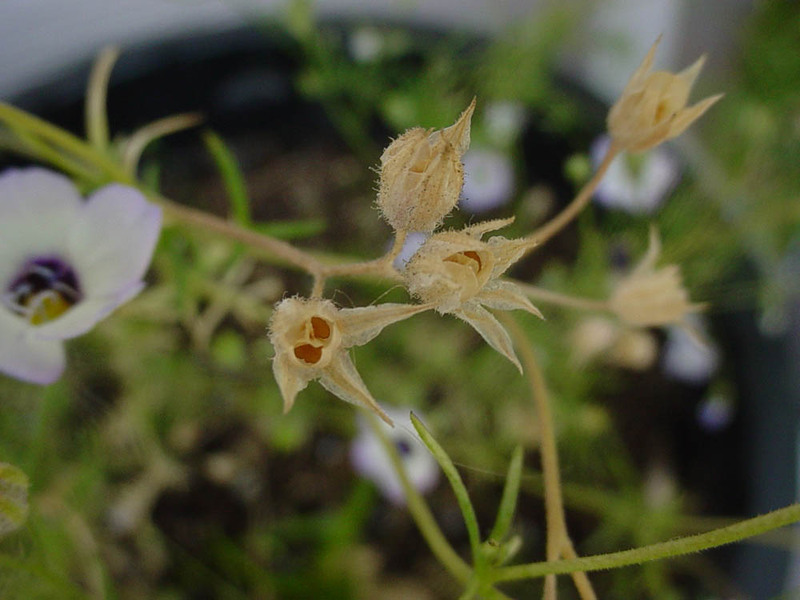 Like most in this family, it has flowers in parts of five and a 3-chamber ovary and seed capsule. Like other members of the family, Bird’s-eye Gila is used regularly in gardens. And this leads to one of the true puzzles regarding this species: is it native to Los Angeles County and further south? 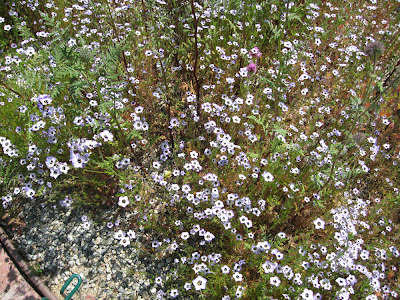 Bird’s-eye (Tricolor) Gilia is still common along California’s north coast, Sierra Foothills and Central Valley. The earliest voucher records for Gilia tricolor in Los Angeles County come from the early 1930’s (California Consortium of Herbaria). 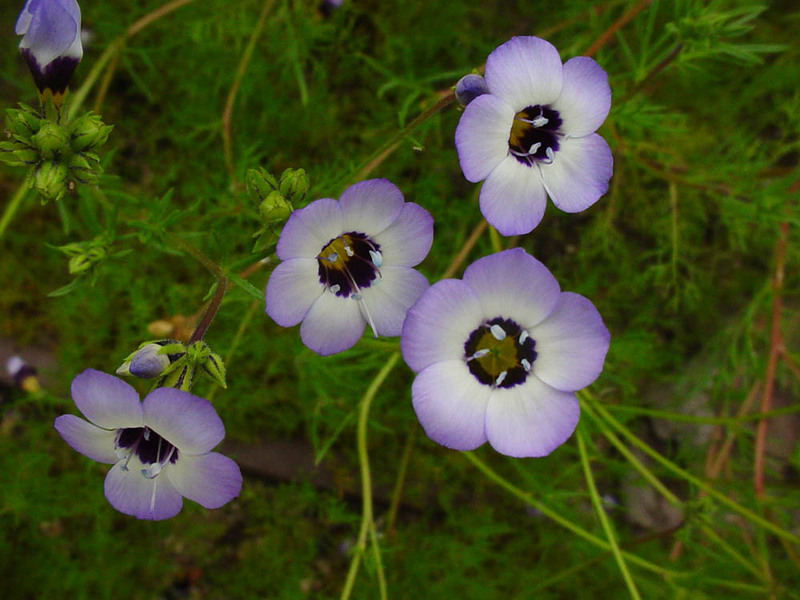 By comparison, records for Gilia angelensis, a similar species, are numerous dating back to the 1880’s. So is Gilia tricolor a Los Angeles native or an escapee from early native plant gardens? We think the jury is still out – but urge viewers more knowledgeable than us to weigh in. At any rate, Gilia tricolor is readily available from seed companies, while Gilia angelensis is not; we gardeners will have to content ourselves with Gilia tricolor for the time being. 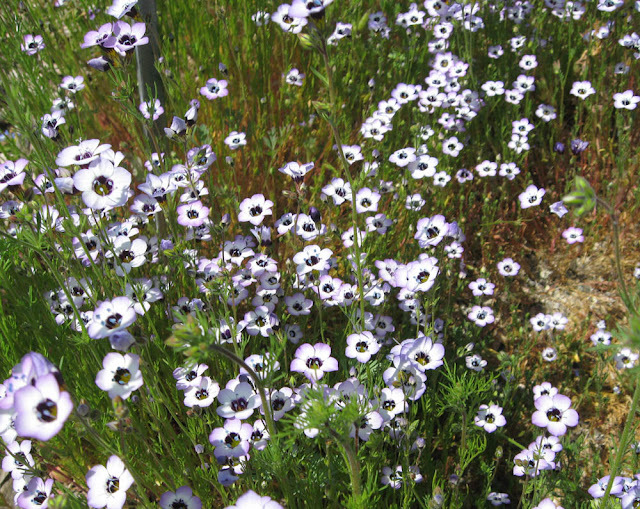 Like most annual wildflowers, the size of Bird’s-eye Gilia is strongly related to soil moisture. It can grow as short as 4-6 inches in a hot, dry spring – or as tall as 2-3 feet in a well-watered garden. In the wilds – or if you sow seed directly into the garden – Gilia tricolor can grow densely packed. Like many of our annual wildflowers, it doesn’t seem to mind the crowding; so you don’t need to thin the seedlings. 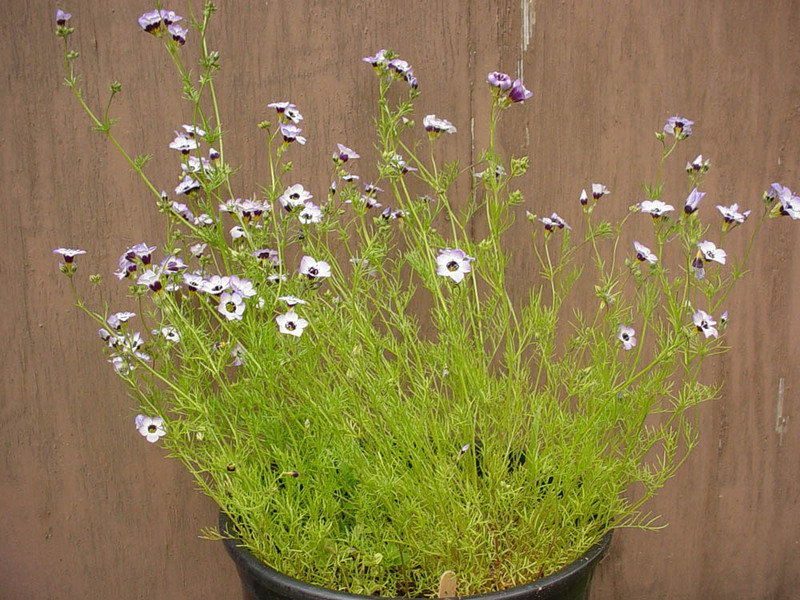 If you start Gilia tricolor in pots, space the plants every 15-20 inches when you plant them out. Then you can fully appreciate the foliage and flowers. Tricolor Gilia has bright to medium green foliage. The leaves are finely lobed, giving the plant a delicate, fern-like appearance (see above). The foliage makes a pleasant contrast with other spring annuals like Tidy-tips, Goldfields and the Lupines. The plants are many-branched, giving them a bushy appearance. The flowers are what make Bird’s-eye Gilia so appealing. From a distance, the plants appear covered in small white flowers (see above). At close range, you appreciate the complex color scheme of these little flowers. Flowers range from about ¼ to ½ inch in width and are solitary or in small, loose clusters. The five petals are fused into a trumpet-shaped corolla. The outer lobes are white to pale blue or violet. The corolla tube is yellow with distinctive blotches of dark purple (see photo below). A finishing touch is provided by the powder blue stamens. The result is nothing short of extraordinary! The common name – Bird’s-eye – refers to the flower’s coloration, which is said to resemble a bird’s eye. The old-fashioned flowers of the Bird’s-eye Gila are numerous. On a warm spring day, their aroma can be quite strong. To some, the scent is reminiscent of chocolate; to others, it smells more musky than chocolatey. Either way, the plants attract hummingbirds, native bees and an occasional butterfly. Bird’s-eye Gilia is easy to grow. In fact, it makes a good choice for a child’s garden. Because birds love the seed, the best bet is to sprinkle the seeds just before a good rainstorm. Rake the seeds in lightly, then keep the soil moist during the growing season. In many years, rain provides enough winter/spring water in our area. But don’t hesitate to water if needed. Seeds germinate in 2-3 weeks. 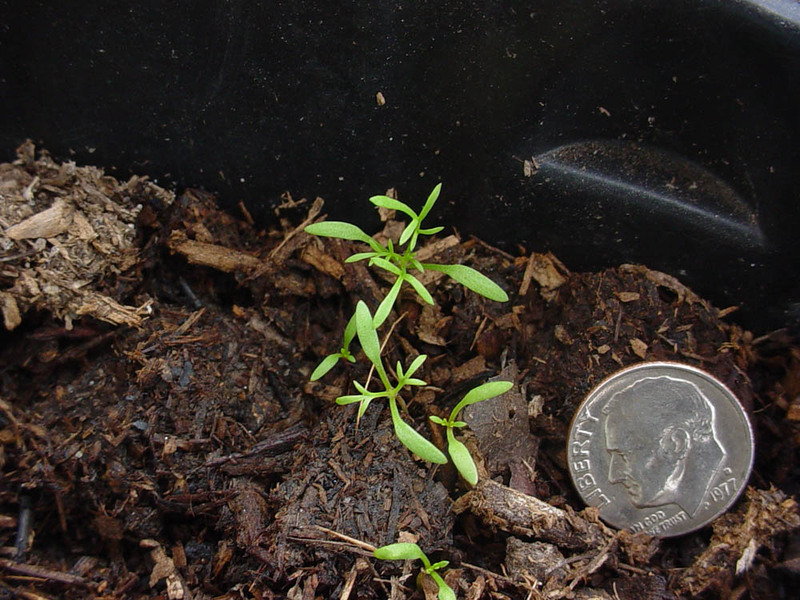 The seedlings are distinctive looking (see photo above). Once flowering slows down, taper off the water to let the seeds develop. You can either collect the seeds (see picture of the seed capsule, below) or let the plants re-seed naturally. For more on gardening with annual wildflowers see our January 2013 posting. 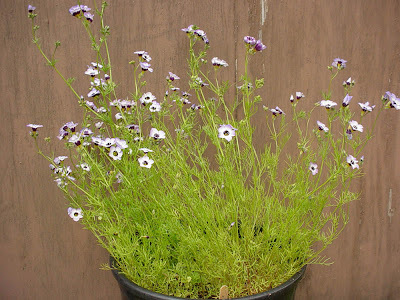 There are many ways to use Bird’s-eye Gilia in the home garden. This is not a persnickety plant; in fact, it thrives on neglect. It can be grown in full sun or part-shade. So it’s a perfect choice for areas that are difficult to access or water. Gilia tricolor looks good when grown with other yellow, white or blue-purple native annuals (see http://www.slideshare.net/cvadheim/south-bay-native-plants-annual-wildflower-311 for a list of annual wildflowers recommended for S. California gardens). One of our favorite ways to grow wildflowers is in pots, providing a splash of color on patios, porches and walkways. Bird’s-eye Gilia is right at home in any flower bed and makes a good filler between shrubs and under tall trees. Consider using it as a short-term ground cover until larger plants grow to size. It also makes a good pollinator plant around the edges of a vegetable garden or home orchard. 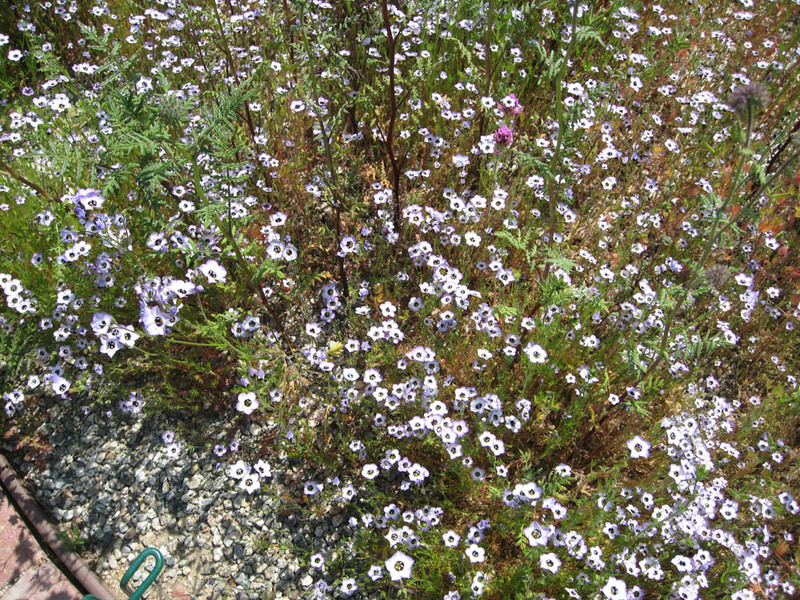 Be sure to plant enough Bird’s-eye Gilia to provide seeds for next year and flowers for drying. The flowers can be pressed or dried (see our posting on pressed flowers later this month) and retain their colors well. The flowers also make nice cut flowers for bouquets. However you use them, the flowers of Bird’s-eye Gila are sure to capture your heart!